In a medium bowl, whisk all the ingredients together and let sit for at least 10 minutes. The longer the sauce sits, the hotter it gets, as the vinegar brings out the heat of the chile flakes (so start with the amount of chile flakes called for and then add more to taste). 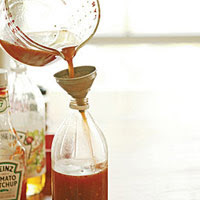 Pour the sauce in a vinegar style bottle so you can pour and store it easily. It will keep almost indefinitely in the refrigerator. This entry was posted on 10:07 PM and is filed under Grilling . You can follow any responses to this entry through the RSS 2.0 feed. You can leave a response, or trackback from your own site.